Make memories that last a lifetime in your favorite Ocean City vacation destination! 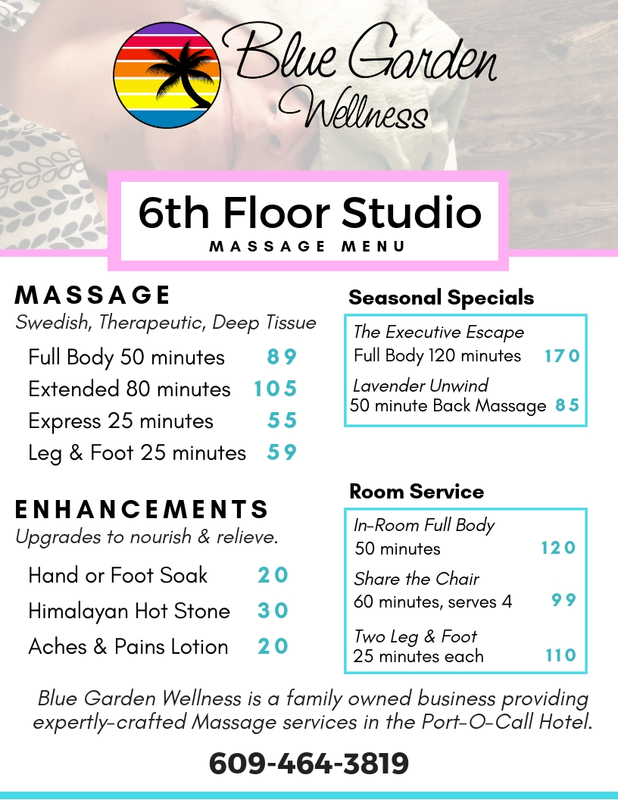 Blue Garden Wellness is located on the 6th floor of the Port-O-Call Hotel. Blue Garden Wellness is dedicated to providing a memorable experience for each guest through exceptional service. Only the highest-quality products are used, and treatments can be customized. The Menu of Services includes full-body massage, leg and foot massage, deep tissue massage, aromatherapy, hot stone, and chair massage. Our ‘Share the Chair’ group chair massage for families to share including children ages 5 and up! Ask about group and corporate services, and bride and bridal party packages. Call 609-464-3819 to schedule your massage today!